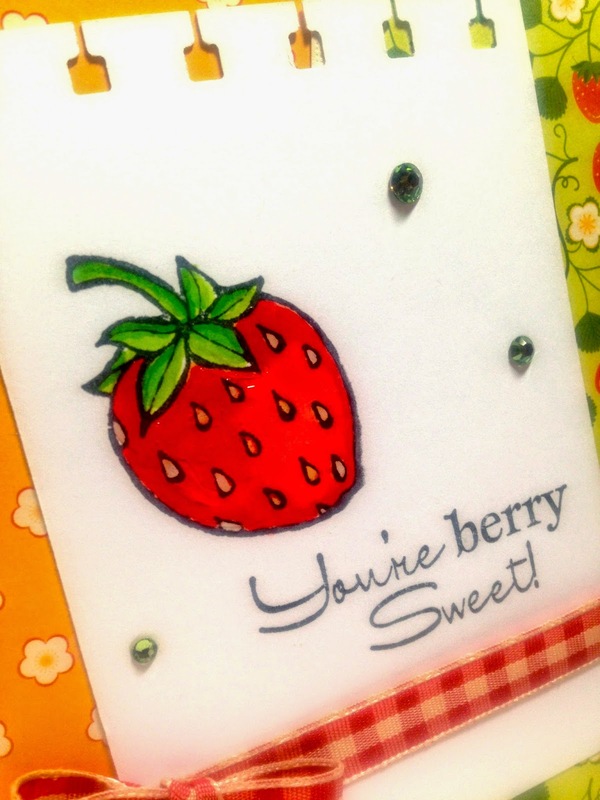 Amy's Creative Pursuits: You're Berry Sweet! Hello! How is everyone doing on yet another bitter cold morning (unless you live somewhere warm that is)? After a frigid Sunday and Monday, I thought we were all in need of some sweet summer thoughts, and nothing reminds me more of the beginning of summer than STRAWBERRIES! I absolutely love strawberries! There are many strawberry pastures where I live and it is quite common for locals to go and pick berries all day and then make jams, jellies, and lots and lots of my favorite dessert: STRAWBERRY SHORTCAKE! I personally don't like to pick them, but I do go to the farm for the freshest berries. I just pay a few cents more and buy the pre-picked ones. The card below I actually made a couple of months ago for my in-laws to thank them for their Christmas gifts. The image is a retired set from Fiskars. I covered the strawberry with glaze to make it extra juicy looking. My paper is from Cosmo Cricket Garden Variety. I used a notebook punch on the main image panel, and wrapped a gingham bow around it. I added just a few adhesive gems for embellishment. So what about you? Do you like strawberries? Do you have any farms where you live where you can pick the berries yourself for a reduced rate? I'd love to hear from you! Oh yes! I am a strawberry fan! Hubby and I hope to plant our first batch of them at our "new house" this year..no time last year after we moved in. Love the gingham ribbon as I think it goes so well with the theme! :) Great card Amy!! I love strawberry pickings! I remember as a young child, my mom would take me and my siblings to a strawberry pasture to pick our own strawberries. Then afterward, we would make all kinds of strawberry desserts. We would share these desserts with our cousins who lived next door. Such a fun memory. 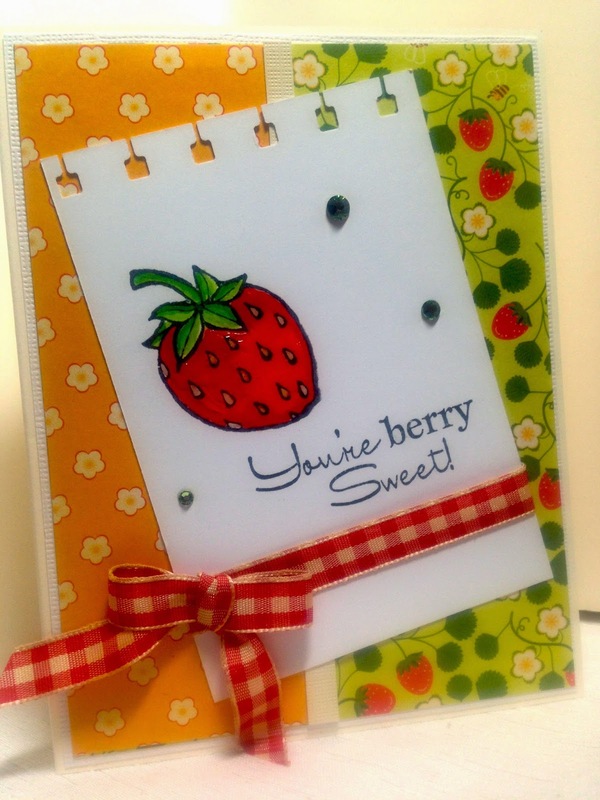 Great strawberry themed card. Love the glaze. Perfect! What a fun card Amy and great idea to add the glossy accents! I love strawberry picking, we usually just pick enough to snack on for a couple of days (until our tummies hurt LOL) Maybe this year I'll try making strawberry preserves :-) but my favorite way of eating them is as a fresh fruit. What a berry sweet card this is! Love the image, and that ribbon is too cute! Great card!